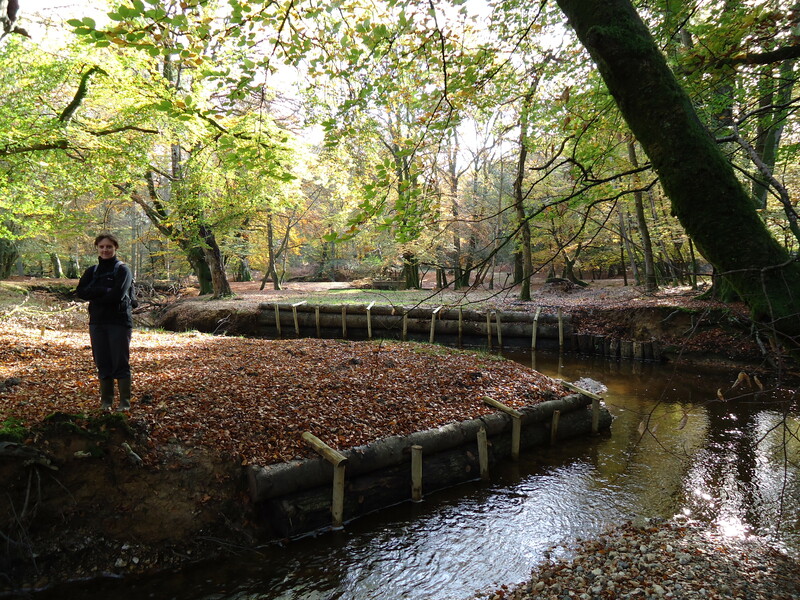 I’ve done a fair bit of research on the streams of the New Forest national park and have seen first-hand a number of restoration projects as well as the results of many more that have been undertaken in the past ten years. Many of these projects have been great successes, but there are a few instances of projects which have had unintended results. One example which I’ve kept an eye for the past four years or so is a project which has experienced some geomorphological side-effects mainly outside of the restoration area. Whilst this is a site specific issue, and I’ll explain why I think the geomorphology has adjusted in unintended ways, I feel the issue says something wider about the importance of fluvial geomorphology in river restoration. 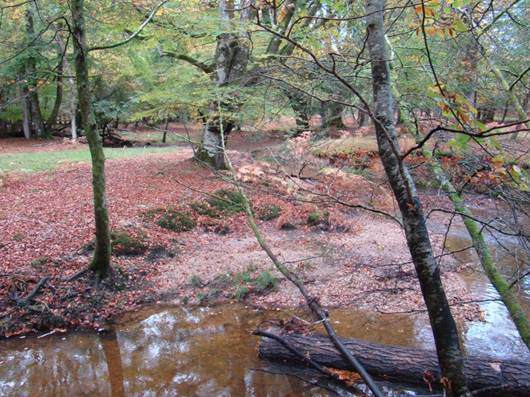 The area in question is on a small river in the North-East of the New Forest national park and is on a meandering section immediately upstream of a small bridge where a forest access track crosses the river. The channel in this area is heavily incised below the floodplain by up to two metres and the banks are being actively eroded on the outside of the meander bends. 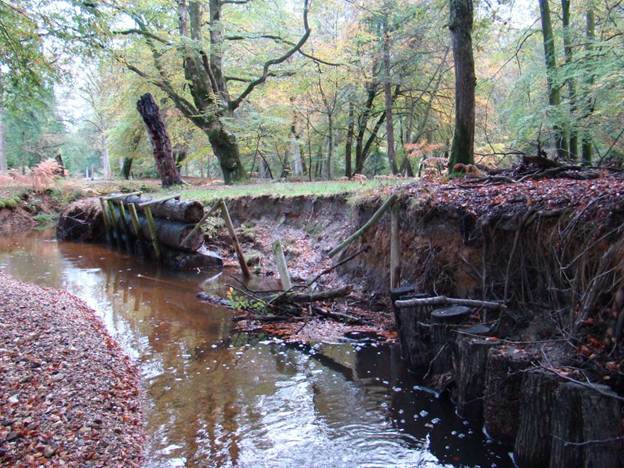 In the picture shown the river managers have attempted to counter this “run away erosion” by installing staked logs as rip-rap to reinforce the banks. This photo was taken in November 2011. The picture below shows the same area earlier this month (November 2013). The logs have been eroded away and transported downstream by some distance, considering the logs are 5.5m in length and around 30cm in diameter. 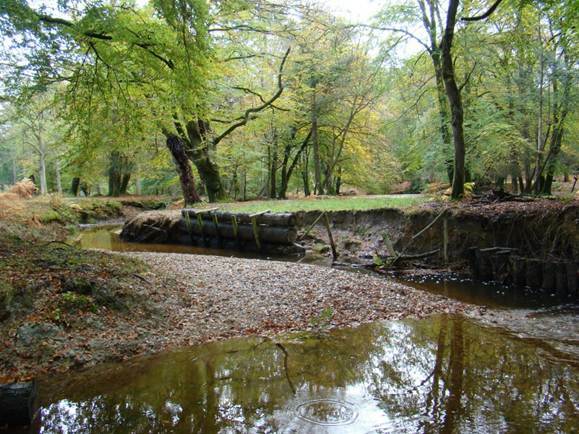 In order to consider why these bank protection measures have failed and what could possibly be done to arrest the erosion it is vital to consider the geomorphological context that this reach sits in, as well as the geomorphological history of the catchment. This is a fundamental in considering any fluvial geomorphological problem; look upstream and look downstream. In fluvial geomorphology the causes are seldom found in the same place as the symptoms. In this case the river was historically channelized making it straighter and deeper. Although this planform was imposed on the environment, the system has adjusted to the slope, stream energy and sediment transport, in the years since, so that by and large the system was at an equilibrium, or at least geomorphogical change was gradual. Approximately ½ kilometre upstream of the reach in question a large section of river was restored in 2005 to its pre-channelised planform and the bed level raised. Cartoon showing the long profile of the river pre-restoration (solid line) and the long profile after the restoration works (hashed line). The locally increased slope at the end of the restored reach acts as a focus for erosion. The raised bed level and increase in sinuosity results in a decrease in bed slope (the river is now longer due to the increase in meanders). The decreased slope slows the passage of water through these restored reaches (as water flow is driven by gravity). However the presence of the bridge over the river downstream of our reach acts as a hard-point. The elevation and bed-level at the bridge remains fixed, the bed level here cannot be raised reliably and the river bed cannot erode due to concrete reinforcement. Therefore if we consider the long profile of the river there is now an increased gradient through our reach between the end of the elevated bed level in the restored section and the fixed elevation of the bridge. This increased slope has increased the speed of the water and the erosional power of the water (called shear stress). The following equation shows shear stress at the river bed is a product of acceleration due to gravity and water density (both fixed) along with bed slope and water depth. I won’t go into a fully mathematical argument of this point, but its sufficient to show bed slope is very important in erosion & transport of sediment. As a result the bed in our reach has been eroded and down-cut, and a process known as “knick-point recession” has occurred whereby small steps in the bed profile erode back up the length of the river. 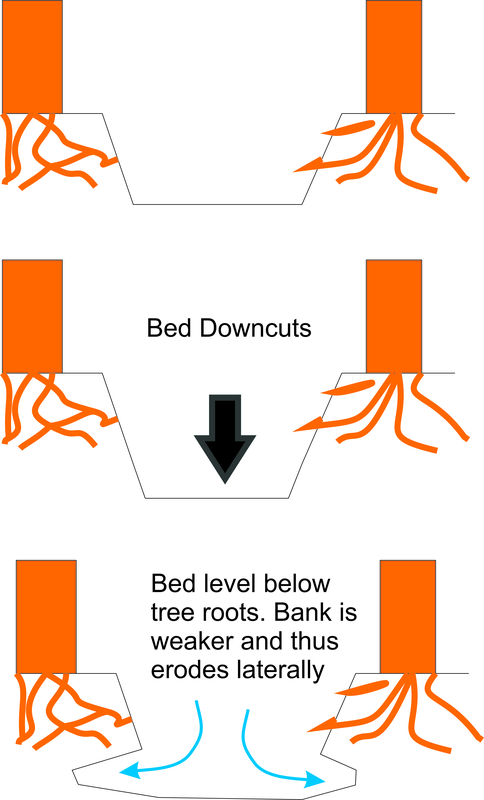 The river bed is now sufficiently down-cut that it is lower than the depth of the roots of most of the riparian trees and thus at the outside of meander bends the banks are even more susceptible to erosion by the higher energy stream as the bank material is not held together and reinforced by root systems. I hope this demonstrates that the “problem” here is not the weakness of the banks per se, but the newly increased power of the stream to do erosional work. Increasing the strength of the banks to arrest the erosion is never likely to work long term as the stream still possesses the same power/capacity to erode. Reinforcing part of the bank will often just concentrate force and erosion elsewhere (this same issue occurs in trying to protect soft coastal cliffs from erosion). In this case the erosion has been concentrated at the front end of the bank defences, eroding away the small upright posts first, then eroding behind and under the large logs eventually causing their failure. So what can be done to arrest this run away erosion? It’s not an easy problem to solve and highlights the problems of conducting reach-based river restoration in general. However going back to my analysis that we have an imbalance between stream power and bed/bank resistance, and given I’ve highlighted the issues of trying to reinforce the substrate the logical conclusion is to reduce the stream power. There are three possible methods I can see as potentially working here. 2) Increase the sinuosity of the reach in question. By increasing the length of stream through the reach the distance along which the drop in elevation takes place is increased, thus lowering the bed slope, water velocity and shear stress at any given point. This is challenging as it is a lot of work, would be an imposed river planform (not “restoration”) and would be difficult to get right. 3) Increase energy dissipation in the reach. The installation of large boulders and large pieces of dead wood in the channel (large woody debris) will increase turbulence and possibly induce steps (mini-waterfalls) all of which dissipate energy and thus lower erosion. I should point out what I am advocating here is not the sort of tiny pieces of wood which are typical of “large” woody debris installed in river restoration projects! This would require entire mature trees and very large boulders and would need to be done in the understanding that the objective is the decrease of overall erosion through energy dissipation, locally there may be an increase in erosion due to flow diversion and a lateral buffer zone would need to be established in which it was acceptable for the river to migrate. If I was the river manager for this catchment I would advocate a pragmatic approach of combining 1 and 3. However it is important to acknowledge that in no way could this be described as “restoration”, these would be pragmatic solutions for erosion control. It is very attractive to argue that an even more pragmatic solution would be to establish a buffer zone for erosion, allow the river to get on with it and eventually establish a new equilibrium on its own. The remaining issue being to maintain the asset of the river crossing of some description. The main point to emphasise here is that a well-meaning river restoration project, which has been well executed, has had unintended and undesirable consequences. Due to a general lack of monitoring of projects it is impossible to know how symptomatic of river restoration projects in general this example is; indeed I have no knowledge of whether this on-going erosion has been identified as linked to the restoration upstream by the river manager. Due to practical and economic constraints it is often impossible to do anything but reach scale and patchwork restoration projects, but in these cases it is vital to project success to understand the geomorphological issues and to embed the project within the river system both upstream and downstream. This entry was posted in Uncategorized and tagged fluvial geomorphology, management, restoration, restoration techniques, river basin management, river management, river restoration, Water Framework Directive. Bookmark the permalink.